The debate over hydraulic fracturing is heating up in California, as the state released draft regulations on Friday for the controversial oil extraction technique. This follows a bill signed by Governor Jerry Brown earlier this year that adds new requirements for oil companies to protect groundwater and disclose more public information. “These regulations are the strongest and most comprehensive environmental public health protections of any oil and gas producing state,” said Mark Nechodom, director of the California Department of Conservation, which oversees the state's oil and gas division. “At the same time," he said, "these regulations are designed to ensure that the oil and gas industry in California, which is a key element of the California economy, will remain productive and competitive." The technique by which water, sand and chemicals are injected underground at high pressure to release more oil has been used for decades in California. The long-awaited draft regulations represent the state's first effort to address fracking, beyond the standards for oil well construction. Oil companies must apply for a permit before fracking and disclose where it will take place, how much water will be used, the source of that water and how it will be disposed of. They must disclose what chemicals are used in fracking, but not the concentrations in cases where they claim a trade secret exemption. Oil well operators must provide at least 30 days advance written notice before fracking, to landowners and neighbors within 1,500 feet of the well. Property owners may request water quality testing of their own wells before and after fracking. Well operators must review earthquake faults in the area to ensure that the fluids used fracking don't migrate along faults. An independent science panel will study the potential risks from hydraulic fracturing and other extraction techniques like acid well stimulation and report by January 1, 2015. State oil and gas regulators will do an environmental impact review of the potential environmental risks of fracking in the state and report by July 1, 2015. The state will also set up a website by January 2016 for public information about fracking. The State Water Resources Control Board will create a program to monitor groundwater basins specifically to protect drinking water sources from fracking. “I’m feeling mixed about the regulations,” says David Pettit, attorney with the Natural Resources Defense Council. "We understand we have to do this right and if we don’t, we won’t be doing it the state of California," she said. 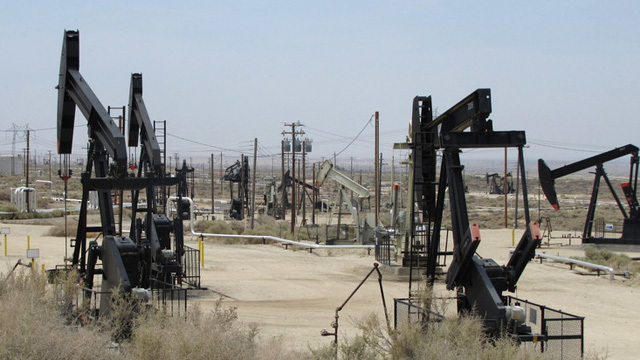 California has a century-old oil industry, located mainly in Kern County. With much of the easily-accessed oil recovered, focus has shifted to the Monterey Shale, which holds an estimated 15 billion barrels of oil. Oil companies say recovering that oil is a challenge, given California’s complex underground geology. “If it is developed to the extent we hope, it really will provide jobs and a valuable to resource to California,” said Reheis-Boyd. Environmental groups say extracting and using that oil runs counter to the state’s aggressive climate change goals. We want to make sure people have an opportunity to know what’s happening in their region. State regulators are required to look at the potential greenhouse gas emissions associated with fracking as part of the statewide environmental impact report. Questions remain about the environmental review of each oil and gas well, under California’s Environmental Quality Act (CEQA). Under the new rules, oil well operators must get a permit for fracking. The permit triggers a review of the potential impacts on the local water, air and community. Officials haven't yet specified how they'll do this review. A comprehensive review could be done on a case-by-case basis for each individual well site, or regulators could rely on the statewide environmental review when granting fracking permits. Questions also remain about whether several wells could be grouped together and approved with a single permit. In a signing statement, Governor Brown directed regulators “to develop an efficient permitting program for well-stimulation activities that groups permits together based on factors such as known geologic conditions and environmental impacts.” Oil and gas regulators say the conditions for grouping wells together will be developed in a separate rule-making process this spring. The fracking regulations take effect on or before January 1, 2015. The division of oil and gas is developing a set of “emergency regulations” that will cover fracking until that time and the agency plans to release those in mid-December. State regulators are expecting a deluge of public comments over the next 60 days. Five public hearings will also be held. Another public comment period will follow in the spring after the agency makes revisions to this draft of the regulations.